Business technology has changed dramatically since Exchange Server 2003 came out. Today, mobile devices are now powerful and more pervasive. Bring Your Own Device (BYOD) is a reality in most businesses. And users have new expectations from their email, calendar, and messaging environments. Newer Microsoft Exchange platforms have kept pace with these changing expectations. Although Exchange 2003 has remained a stable platform for business email, it is a product of a technologically simpler time. And now, its time has come. 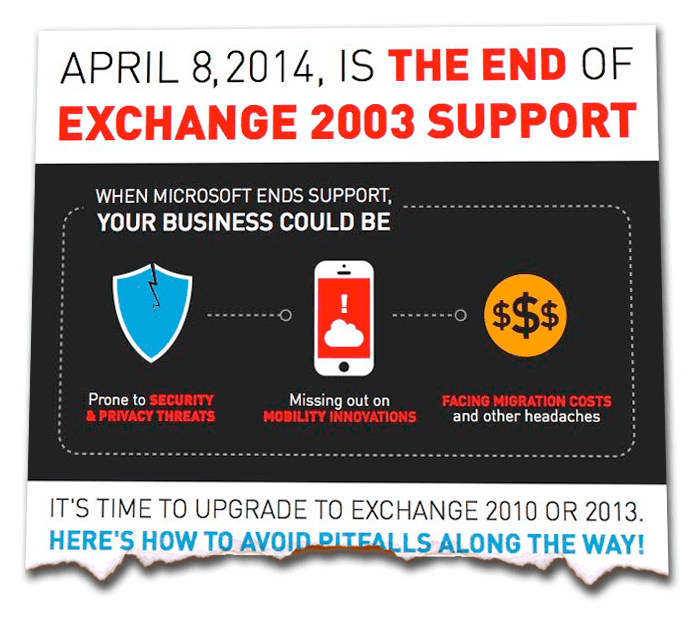 On April 8, 2014, Microsoft will end extended support for Exchange 2003. This means that Microsoft will no longer issue security patches. Businesses that are still running Exchange 2003 beyond this date will face security risks. If you’re running Exchange 2003, you must make a decision by April 8th: accept the risk and do nothing, or migrate to a newer version of Exchange. But does everyone in your organization understand what you have to do next — and the risks associated with the choices you face? To date, many businesses have made a sensible decision to continue with Exchange 2003. But the fact that Microsoft is ending extended support for Exchange 2003 changes the risk profile of that decision. Another option is to upgrade an on-premise Microsoft Exchange deployment to Exchange 2010 or Exchange 2013. Beware: successful Exchange upgrade typically requires the services of specialized Exchange migration consultants, as well as significant IT time and budget that detract from other IT initiatives. Learn what goes in to an on-premises upgrade. Companies can avoid the labor costs and capital investments of an on-premise upgrade by migrating to cloud-based Exchange. The choice of the right cloud Exchange provider is important to your cost/benefit/risk equation. The right cloud provider will eliminate downtime risk, keep costs low and deliver on the promise of a reliable, secure and integrated cloud environment for Microsoft Exchange. How do you determine your next steps? Join our live webinar to learn about the challenges—and opportunities—Exchange 2003’s end-of-life presents to you. It’s on Tuesday, March 11 at 12:00 PM ET/9 AM PT. You can register here. If you have questions about, feel free to contact our experts at 800.379.7729. We built the infographic below to help you easily communicate your options to your coworkers. Click to view the full version (which has much more information than what you see here). Feel free to share it!